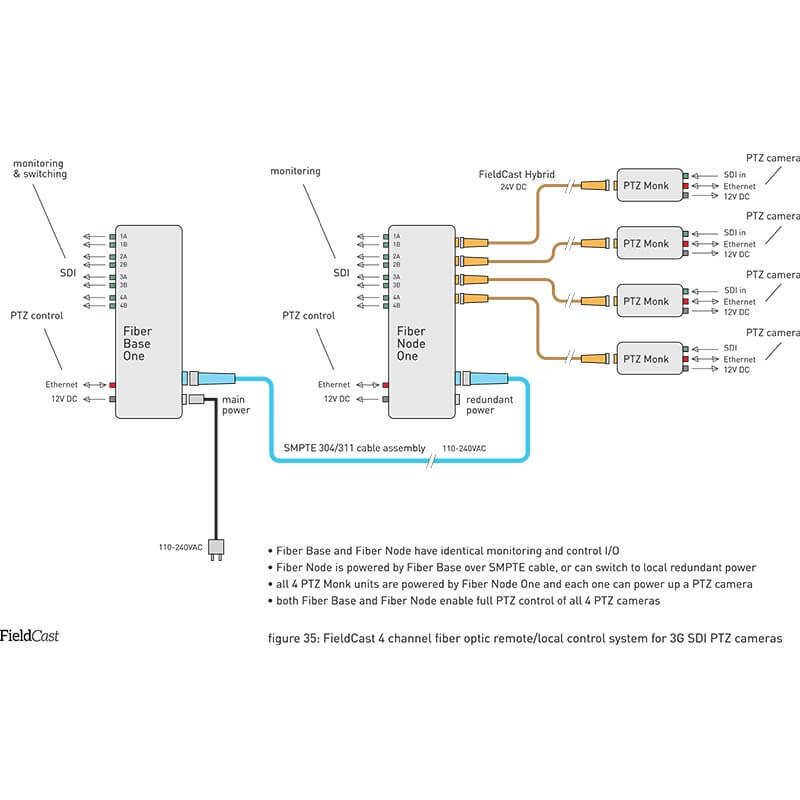 FieldCast Fiber Base One is a four channel fiber optic converter, designed as a remote unit for FieldCast Fiber Node One. It sports one SMPTE connector and needs one SMPTE 311M/304 fiber optic cable to connect to Fiber Node One, to power it and to communicate with it. 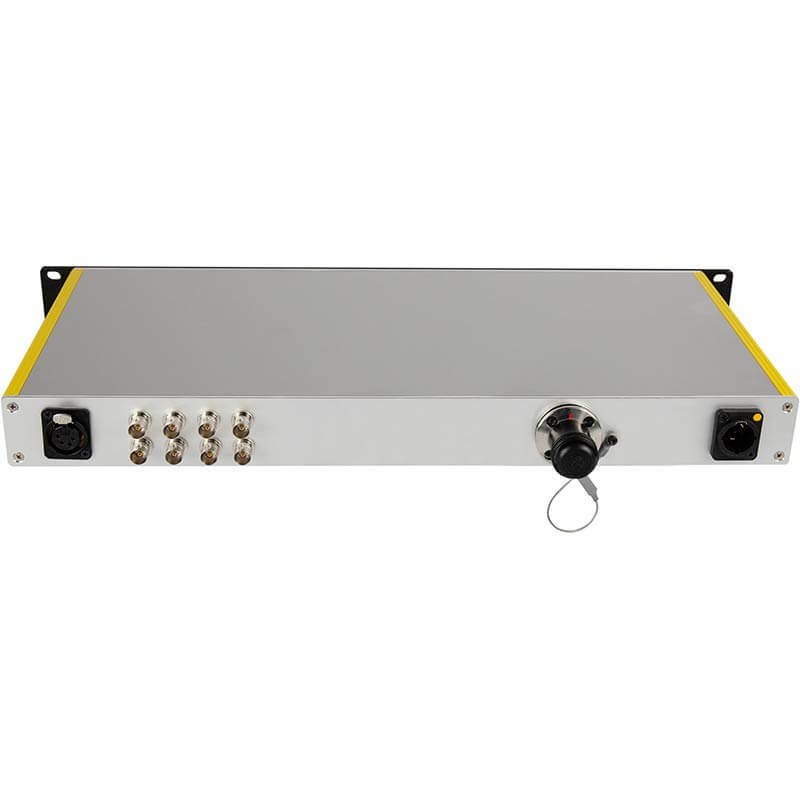 At its input, Fiber Base One accepts any voltage level between 100 and 240VAC, and the output level of the SMPTE connector is equal to the input level. So, when you plug into a 220V power outlet, the SMPTE connector simply offers 220V. 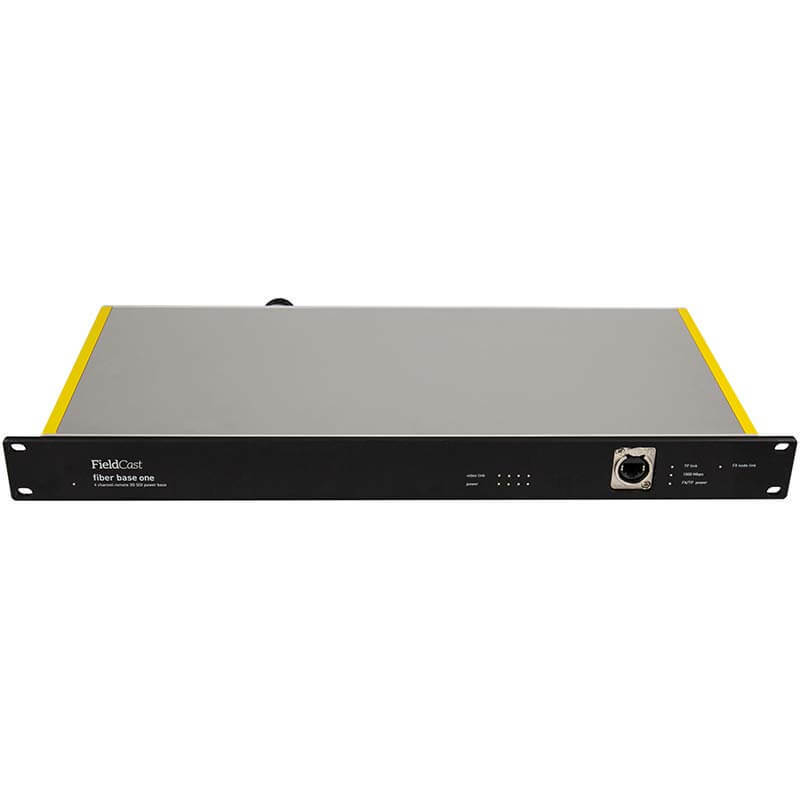 Fiber Base One brings you four channels of 3G SDI output and ethernet I/O, just like Fiber Dock One and Fiber Node One, and you can connect straight to the switcher, plug in one or more PTZ controllers, add a multiviewer, recorders, whatever you want. Communication with Fiber Node One is pretty straightforward. One fiber of the SMPTE cable is used to tap into the fiber optic ethernet switch of Fiber Node. This means that a PTZ controller connected to Fiber Base is part of the same network as a PTZ controller connected to Fiber Node, and both can control any PTZ camera in the network. The other fiber of the SMPTE cable forwards all four video signals that reached Fiber Node One to Fiber Base One, which means that the four SDI outputs of both Fiber Node One and Fiber Base One output exactly the same signals. In other words, when connected, Fiber Base One, the remote system, and Fiber Node One, the local system, are functionally equivalent and can work together. Typically, Fiber Base One will be placed in a control room or OB Van and connects to the switcher, where Fiber Node One will be mounted in a flightcase and connects to a portable multiviewer.